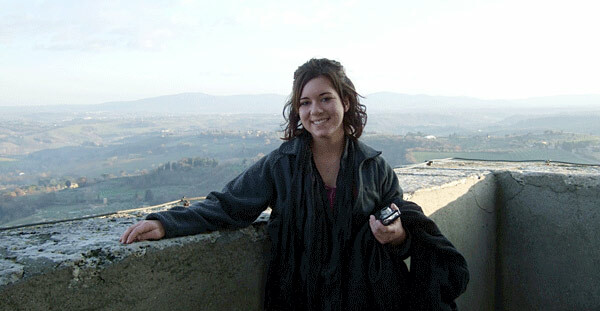 Alina BigJohny traveled to Italy and Greece for a January Session 2010 class in Comparative Civilizations. The Manchester College community is shaken and saddened by the unexpected death of Alina BigJohny, a May 2011 graduate of ability and conviction. Alina, an education and English major who was consistently on the Dean’s List, brought talent, energy and optimism to her studies and her friendships. Alina embraced her Manchester College experience with her commitment to learning. Just months ago, she completed great student teaching experiences in English and special education in the Warsaw and North Manchester schools. She was involved in a wide range of College activities, including student recruitment, new student orientation and the College Dance team. She was also an award-winning writer for the campus newspaper. Manchester College is a better place because of Alina BigJohny. We will miss her. Funeral services were Friday, Aug. 18 in Fort Wayne. Click here for the obituary. On Friday, Aug. 19, former Manchester student Jennifer Haskell, 23, also died of injuries suffered in the Aug. 13 stage collapse at the Indiana State Fair. Services are in Parker City, Ind., at Monroe Central High School. Visitation is 4 to 8 p.m. Thursday, Aug. 25, with the service at 3 p.m. Friday, Aug. 26. The Meeks Mortuary, Muncie, is handling arrangements. Click here for the obituary.